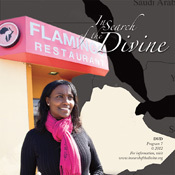 In this seventh edition of In Search of the Divine, immigrants Shegitu Kebede of Ethiopia, Thupten Dadak of Tibet, and Vina (Sokhavudkh) Oeum of Phnom Penh, Cambodia talk about fleeing their native countries. Now U.S. citizens, business and home owners, each of these amazing people lost family, friends and possessions, and while their stories can be difficult to hear, their lessons of forgiveness, compassion and hope are inspiring. Request a copy or make a comment about this program. The following are brief clips from episode #7 of In Search of the Divine.